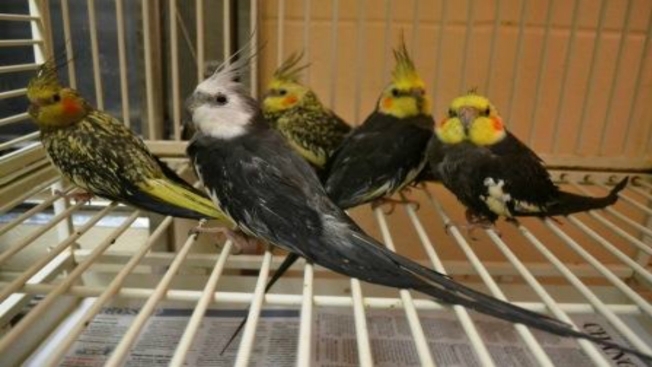 Dozens of cockatiels in New Hampshire are in need of homes after their owner passed away. On Nov. 11, the New Hampshire SPCA responded to a request from a local animal control officer who was dealing with the 45 birds. The shelter staff immediately began preparing for their arrival by gathering cages, bowls and food. When the Cockatiels arrived, they were showing signs of stress and possible illness. A number of them have been diagnosed with respiratory infections. "This was a case of someone who was doing their best with their birds, but when they passed away, the birds needed somewhere to go," says Lisa Dennison, Executive Director of the New Hampshire SPCA. "We are grateful to be able to assist the ACO and the birds, knowing that we will heal their illnesses and, assuming the next of kin surrenders them, eventually make them available for adoption." The shelter is requesting the public's help with donations of cages, perches, cockatiel food and small bird toys. For those wishing to help, please click here for more information, or click here to donate now. Gifts can also be made by mail: New Hampshire SPCA, PO Box 196, Stratham, N.H. 03885.